Are we finally seeing the real Marcus Rashford again? 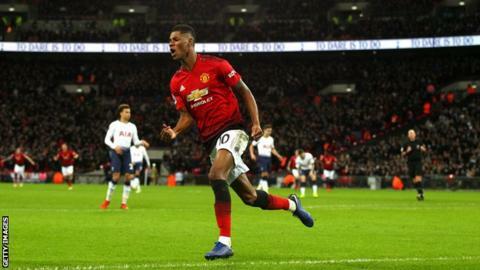 The England striker is flourishing under Manchester United caretaker manager Ole Gunnar Solskjaer and scored the winner as they beat Tottenham 1-0 on Sunday. It was the 21-year-old's fourth goal in six games under the Norwegian and was the first time he has scored in three consecutive Premier League appearances. After being in and out of the team under Jose Mourinho, he has been given a prolonged run as a centre forward by Solskjaer and is keeping £75m Romelu Lukaku out of the side. Before Sunday's win, Solskjaer said Rashford could become a "top, top striker" in the class of Tottenham's Harry Kane. So how does his record stack up against Kane and other former 'wonder kids' Wayne Rooney, Michael Owen and Cristiano Ronaldo? Rashford burst on the scene as an 18-year-old on 25 February 2016, scoring twice on his senior debut against Danish side FC Midtjylland in the Europa League after being handed a surprise start by Louis van Gaal. Nearly three years later, he scored his 24th Premier League goal and his 40th in all competitions for United against Spurs. He is way ahead of his international captain Kane at the same age, whose breakthrough season for Spurs was not until 2014-15 when he was 21. But Kane has flourished since then, winning the Premier League golden boot twice. However Rashford's start to his career is eclipsed by former Liverpool striker Owen, who made his debut for the club as a 17-year-old and went on to score 158 goals in 297 games for the Reds, winning the 2001 Ballon d'Or and becoming a two-time Premier League golden boot winner. Former United team-mate Rooney had also scored more goals at the same age as Rashford. England's record goalscorer memorably notched his first Premier League goal against Arsenal for Everton just five days before his 17th birthday, which at the time made him the youngest goalscorer in Premier League history. Portugal captain Ronaldo, now at Juventus, arrived at United from Sporting Lisbon and bagged his first league goal aged 18 against Portsmouth in November 2003. Rashford faces a daunting task to end up with a trophy haul to match the 33-year-old five-time Ballon d'Or winner, but he is keeping pace with the ex-Real Madrid forward in his United career to date. It is worth remembering, though, that Ronaldo arrived at United as a winger and it wasn't until later in his Old Trafford career that he played as a striker. Rashford has started all five Premier League games since Solskjaer took over at Old Trafford, with Lukaku only making one start - in the 2-0 FA Cup win over Reading. Lukaku has been making more of an impact off the bench, scoring twice as a substitute in the wins against Bournemouth and Newcastle. Despite his diminished role, the 25-year-old Belgium forward is still United's top scorer on nine goals alongside Paul Pogba, and one ahead of Rashford. What are they saying about Rashford? Premier League record goalscorer Alan Shearer puts Rashford's current form down to the belief Solskjaer has shown in him. "Rashford is flying right now because he has a manager with complete belief in him for the first time," he wrote in the Sun. "He is the main man at Manchester United now and has every attribute in his locker to thrive as a striker going forward." Former Tottenham striker Robbie Keane said the youngster reminds him of Arsenal legend Thierry Henry. He said: "When Henry came here you weren't sure if he was a striker, if he could finish. He was playing on the left and right wing. He had genuine pace like Rashford but now he is playing as a number nine. "Solskjaer has seen in him that he is a genuine striker who can score goals. To leave Lukaku out, who cost £75m, and play a 21-year-old is huge. He can achieve a hell of a lot, he is only going to get better." United team-mate Juan Mata, writing his weekly column, called him simply "the Wonder Kid".